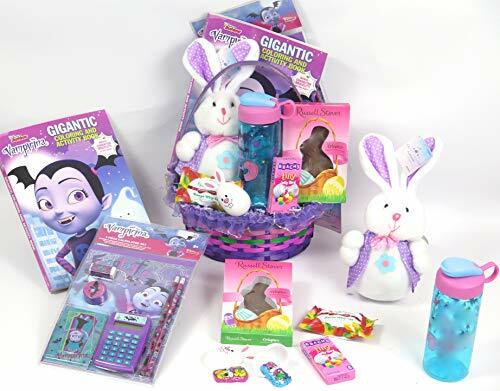 Miss Botique - Girl's easter Vampirina basket Kid's Easter basket. Spin Master 6041272 - It’s a hatchimals egg-travaganza! find six exclusive hatchimals colleggtibles inside a colorful basket! with four in-egg and two out-of-egg characters, and a beautiful purple scalloped heart! To hatch, then press down to crack the shell! Who will you hatch? These pastel-colored characters have a luminous pearly finish and glittery wings! Tuck your new friends into the Basket and carry them wherever you go! Make easter memorable: ombre eggs! pastel colours! Exclusive characters! There's so much hatchifun inside the Basket! With four in-egg and two out-of-egg characters, there’s so many new friends to hatch and collect! These egg have a vibrant yellow to pink ombre finish, rub the purple heart until it changes color, hold each egg in your hand, it's the perfect edition to your collection!. Hatchimals Basket is for kids aged 5+. Hatch your colleggtibles, then peel your egg down to the wavy line at the bottom! Throw away the top pieces and now you have a cozy nest - the ideal place to display your adorable friend! Inside the basket are six exclusive hatchimals CollEGGtibles and 8 nests! That means there's room for more of your friends! Now you can play and display your CollEGGtibles!